The picture above is an 1887 treatment of this story by American artist George Hitchcock. In every other painting of The Annunciation that I’ve seen (cf. 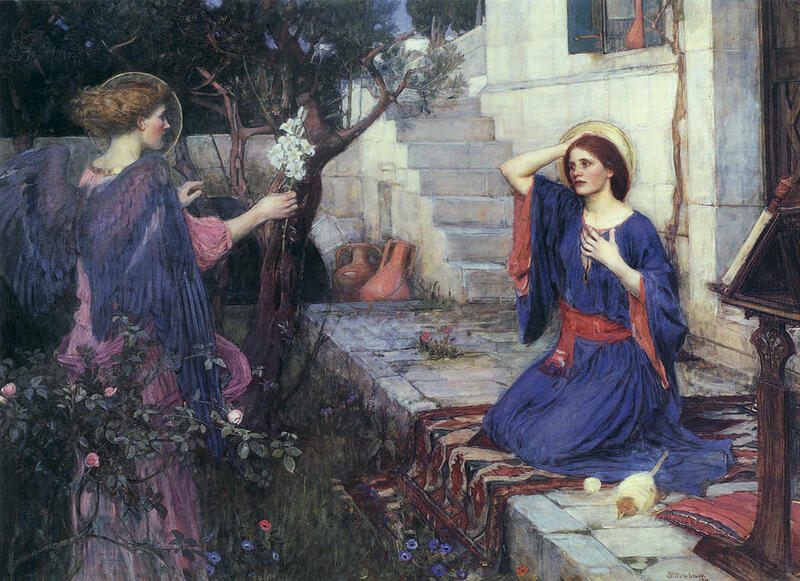 John William Waterhouse’s 1914 painting at the top of this entry), Gabriel stands before our heroine, wings unfurled, sometimes holding a lily—both an emblem of himself, and a symbol of her virginity. But Hitchcock replaces Gabriel altogether with a field of lilies. What if instead of an angel appearing in a dazzling theophany with a spoken message, God simply spoke to the young girl’s heart as she walked through her day? And this makes me wonder what signs I may miss while looking for God’s word to be given me in bold and dazzling ways. Perhaps I’m receiving quiet messages from God all the time, and I simply need to listen more closely, and notice the field of lilies in which I’m standing. I love this. I love your ending, pondering to yourself which invites the reader to wonder the same…..